Sweden lived up to the tourist brochures on day two of fleet racing at the RC44 Marstrand Cup. 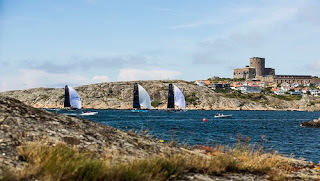 The boats headed out to the west of Marstrand Island where they were treated to three races in a 8-14 knot northwesterly, less tide, a flatter sea state, sunshine and warm temperatures. However the wind remained shifty and it was day that severely tested a tactician's risk versus reward decisions. 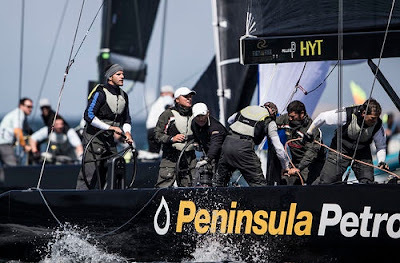 Today the only team not to put in a 'big' result was Vladimir Liubomirov's Bronenosec Sailing Team, with a 1-3-3 scoreline, causing her to prise the overall lead off Team Nika in the final race. "We were very conservative. This is the goal for this event for us to never to take risks. These conditions were good; sunny, windy and not too wavy. Of course the wind was shifty and it was very difficult to get the proper direction, but most importantly for us is that we were consistent," Liubomirov said. The problem is that in this 10 strong fleet, all the crews feel the same. And so, not surprisingly, today there were three different winners, bringing the total number of winners up to five from six races. 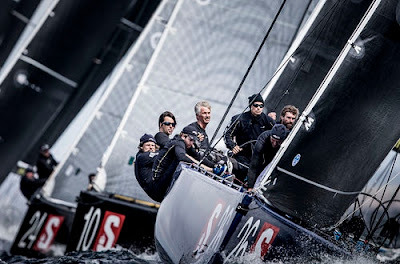 After winning Tuesday's match racing, Bronenosec has only finished off the podium in one fleet race, which Italian tactician Michele Ivaldi puts down to a combination of going the right way, his skipper steering well and good boat speed, thanks to trimmers Paul Westlake and Maciel Cicchetti. "They did a fantastic job - we had clean starts, clean lanes upwind and the speed did most of it. We got a few good shifts and all the manoeuvres were done flawlessly from the crew," Ivaldi said. Trailing Bronenosec in the overall results are Team Nika, Artemis Racing and Charisma, all of whom had one big score today.Nico Poons' Charisma for example finished last in the first race, but won the second. Their first race result was largely due to a penalty. "We hardly knew for what. 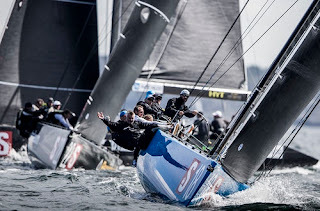 We had to make a turn going into the last downwind leg, so it was hard to recover," as Poons put it. However lying fourth, just six points off the lead and with two days of racing ahead of him, equalling or bettering Charisma's second place here last year is still more than possible. "You have to keep away from shockers like tenth places - that's the name of the game," Poons said. However lying fourth, just six points off the lead and with two days of racing ahead of him, equalling or bettering Charisma's second place here last year is still more than possible. The penalty in the first race was for tacking too close near the top of the second beat. In the second race Charisma went hard right out of the start and stayed away from all the other boats. "It was a great feeling to finally have a good race. We haven't been sailing so well over the last couple of days, so it's definitely lifted the spirits. It's very close, the competition is fierce." said skipper John Bassadone. He said that they had been struggling for speed during the first race but had made a few changes afterwards only to be over early in the second. Even so, the tuning had made all the difference and from being last, they picked up to fifth. In the final race they put it all together and after a good pin end start headed to the port layline, to lead at the top mark and from then on. 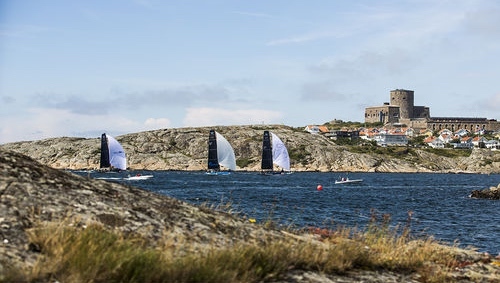 Peninsula Petroleum led the ten RC44s on a spectacular run back into Marstrand Fjord where a special finish line had been set up immediately off the island. 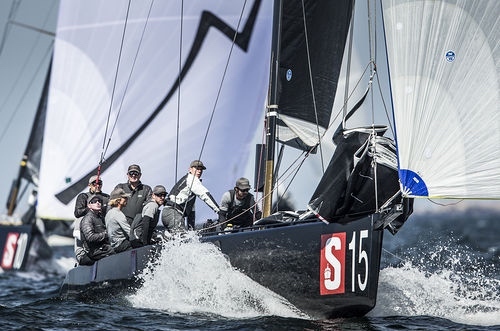 On Artemis Racing, local host Torbjörn Törnqvist had a 3-2, sandwiching a ninth, caused by the Swedish RC44 starting prematurely. "We never recovered from that, never really got into phase again. But that is the way it is. It doesn't take much and you are down there," Törnqvist said. 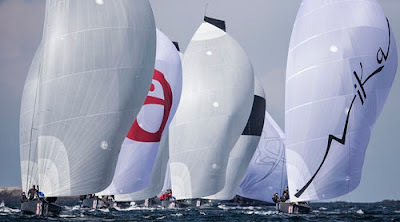 Racing continues tomorrow at 11:30 CET with day three of fleet racing.